can be a frustrating task. All too often a season of carefully tended crops yields only a meager basketful of vegetables spotted with festering holes. But, gardeners can fight back and send in an army of their very own, with less need for protection from artificial pesticides. The members of a gardener’s insect army include “beneficials,” which are essentially the predatory good guys. Such beneficials include lacewings, lady beetles and hoverflies (syrphid flies). These beneficials, along with pollinators like bees, help sustain a balanced garden. But, beneficials must be welcomed into a garden and persuaded to stay with the presence of nectar, pollen, water and shelter from the wind throughout the seasons. Lacewings may be brown or green, usually one-half to three-fourths-of-an-inch long, with transparent wings. They feed on garden threats like aphids, mealybugs, scale, thrips, mites, and various larvae and eggs. Lady beetles are one-fourth-inch long yellow-orange or red insects with black spots which feed on aphids, scale, thrips, whiteflies, spider mites, mealybugs, and other soft-bodied bugs. Hoverflies resemble bees which dart like hummingbirds and feed on aphids, mealybugs, and other small insects. Providing a nurturing environment for these good guys does not need to be a daunting task. To begin farmscaping—the deliberate use of plants and landscaping techniques to attract and conserve beneficials—it is recommended to devote five to ten percent of a garden or farm space to these plants. Choose an area near or bordering your garden where these plants can thrive and provide a relatively undisturbed area of retreat for beneficials. Plants secrete volatile chemicals when pests are feeding on them to naturally call beneficials to the scene of the leafy crime. If your army is poised for action nearby, they are willing first responders. To choose your plants wisely remember a few key aspects of beneficial gardening. First, insects typically favor tiny clusters of flowers with exposed nectaries such as Queen Anne’s lace. Secondly, flowers of diverse colors and forms will likely bring a larger variety of pollinators to your garden. 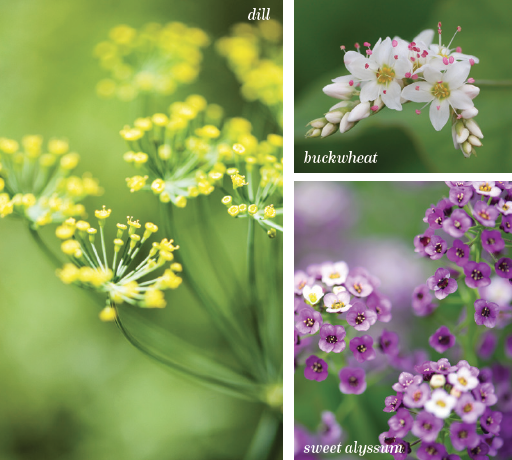 Third, herbs (dill, cilantro, oregano and thyme) attract many pollinators when in bloom. And fourth, don’t forget beneficials often spring into action after damage by pests has already begun. Slight damage to plants is unavoidable, but should be viewed as a necessary part of the process. When choosing plants to host beneficial insects, strive to plan your gardening around each season. To avoid beneficials flitting to your neighbor’s yard during the off season, the insects need to have an ample supply of food and shelter throughout the year. Some plant choices to consider include sweet alyssum (early season), buckwheat (mid-season), and dill (mid-to-late season). Sweet alyssum are hardy, annual plants which will often self-sow for year after year of blooms. These flowers attract hoverflies, require moderate moisture, and prefer full-sun or partial-shade environments. They can often be planted from seed straight into your garden. Sweet alyssum flowers bloom from June to October and can be encouraged to rebloom by cutting back withered flowers. While they require little maintenance, be sure to avoid planting this flower in an area with excessive shade to prevent botrytis blight, a fungus which grows when the leaves and soil do not completely dry between watering. Buckwheat is a favorite of many beneficial bugs and often attracts hoverflies and lady beetles. It is recommended to plant buckwheat around mid-July or early August. Buckwheat will bloom just four short weeks later, enticing beneficial insects and pollinators to the shallow white blossoms. These flowers can be planted easily simply by scattering seeds, but remember to cover the seeds with a quick blanket of dry leaves or soil to discourage birds from eating their fill. Dill is an annual, self-sowing plant which encourages lady beetles, hoverflies, and predatory and parasitic wasps. This plant features feathery green leaves and should be sown as early as two or three weeks before the average date of the last frost in spring. It flowers from summer to autumn and should be planted in full sun. Be sure to leave the soil undisturbed to encourage self-sowing for the following year. 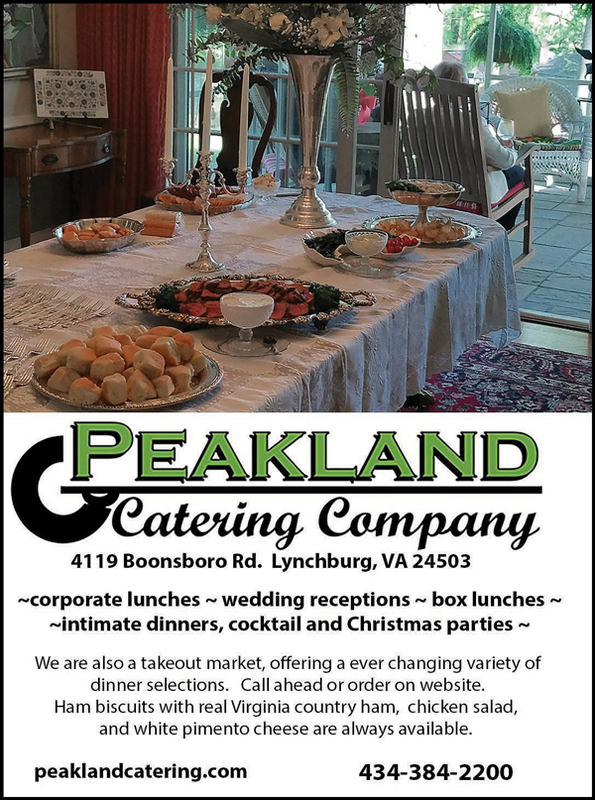 In addition to these selections, plants which are native to the area typically are a sure way to attract beneficial insects and pollinators. Insects tend to be drawn to large perennials such as wild parsnip, elderberry, and viburnum shrubs, or vines such as silver lace or wild clematis. Sunflowers also provide a natural winter habitat for insects when the seeds are left intact. These native plants can be used to equip your garden with a permanent beneficial border to ensure insects are not fair-weather friends and keep patrolling your garden on a long-term basis. 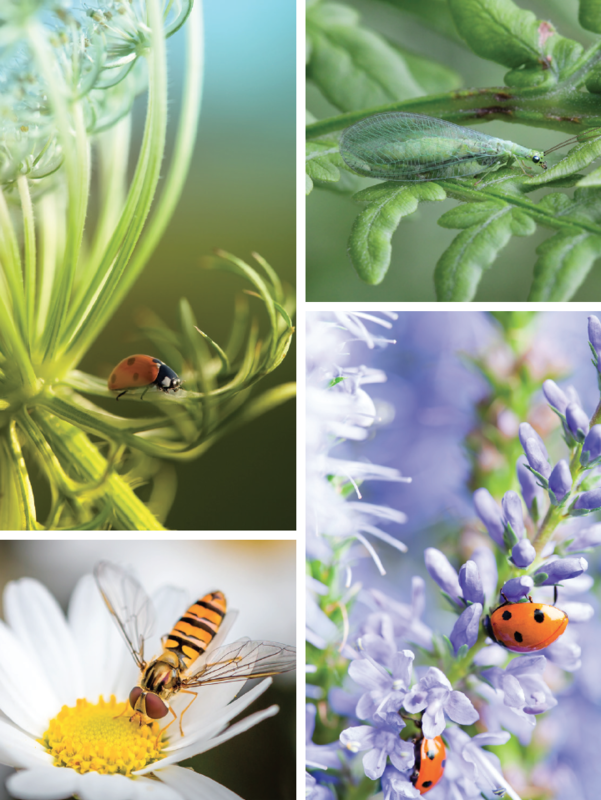 When carefully planning and planting a wide variety of flowers, herbs and shrubs to bloom throughout the season, you can successfully encourage beneficials such as lacewings, lady beetles and hoverflies to call your garden their home. These insects encourage the healthy growth of your garden and positively support overall plant growth and a healthy ecosystem.